While working like a maniac yesterday, I did manage to find time to make a little soup. What a fabulous way to celebrate fall! My household has just two members, my husband and I, so I don’t always have access to bones from which to make a tasty broth. But at the recent church potluck I asked if anybody was going to take home the turkey bones. Nobody claimed them, so I took them home and I spun that hay into turkey soup gold. There are few things in the world that smell quite as awesome as homemade turkey soup bubbling away on the stove. 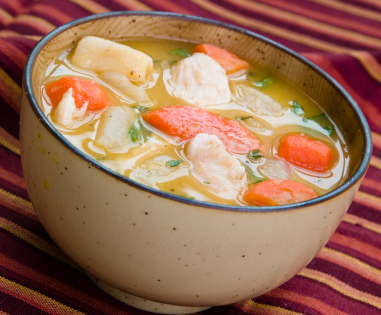 Homemade soups are healthy and delicious! They often have a small amount of meat, a whole lot of vegetables, and you get to choose just how much salt to put in there. (Many commercial soups are extremely high in sodium, so buyer beware!) Also, if you like, you can separate out your broth from the other ingredients and refrigerate after cooking. Once cooled, you can scrape the fat layer off the top if you like your soups a little less oily. Or leave it in. It’s your soup, so make it just how you like! But one of the things I really love about soup, is that I think you can taste the love in there. Seriously! Soup is one of the original slow foods, and the anticipation and the bubbling and the stirring and the steam and the aroma fills your heart as well as your tummy! So, in this time of crazy holiday schedules and stress, I suggest that you set aside just a little time, get out your biggest pot, grab some veggies and an onion and some garlic and make some soup. This entry was posted in Uncategorized and tagged aroma, autumn, bubbling, cold, customized, fall, fat, healthy, love, slow food, sodium, soup, traditional, turkey, vegetables on November 20, 2012 by fatchicksings.